These essays, which span twenty-five years of writing and a lifetime of experience, offer fresh and challenging insights into documentary. 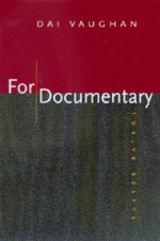 Dai Vaughan, one of the most highly regarded documentary editors to have worked in Britain in recent decades, makes his starting point plain: "Most of us would feel that the word 'documentary' had not justified its place in the dictionary if the films so called did not manifest some relationship with the world not shared by others." That elusive relationship is the subject of his eloquent reflections and analyses. As critic, Vaughan contrasts the Olympic Games films of Riefenstahl (1936) and Ichikawa (1964); as participant, he tells how the introduction of portable 16mm equipment gave rise to cinéma vérité and observational visual anthropology. The twin perspective of analyst and practitioner results in a radical restatement of the documentary project, one in which documentary is seen as engaging the viewer's freedom in a way that fiction does not. A chapter near the end, "From Today, Cinema Is Dead," is uncompromising in its pessimistic view that digitalization threatens the privileged relationship we have always granted between a photograph and its object. Film theorists and filmmakers, indeed everyone who cares about how our society represents itself to itself, will find For Documentary engrossing as well as illuminating. Dai Vaughan, who resides in London, has been an editor of documentary films for more than thirty-five years. His previous books include novels and a biography.